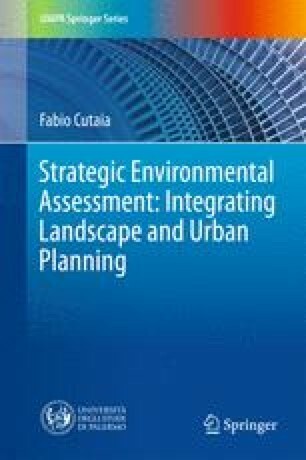 After the examination of two different planning experiences comes the need to offer some indications about assessing effects of planning activity on the landscape. In fact, while the evaluation of components such as water, soil, and atmosphere has already been consolidated using environmental indicators, analysing landscape components—in addition to “cultural” components—is more arduous. There are three essential elements functional to landscape evaluation: landscape units, social participation and indicators. Here, we will describe the functionality of each element as well as indications regarding their use. Accordingly, we propose that the assessment of relevant effects will be the consequent step in the interpretation and evaluation of the landscape itself. Finally, we want to introduce the concept of “Dashboard of Sustainability”: a new device that, if modified in order to contain the different categories of territorial variables—environmental, social, landscape, and economical-institutional—could describe the current characteristics of a landscape with future scenarios proposed by the plan. The typology of data we can obtain from this assessment technique is expressed by a numeric value, according to what is required by the Strategic Environmental Assessment procedure, which uses indicators to describe environment baselines to predict effects of a plan and subsequent monitoring phases.